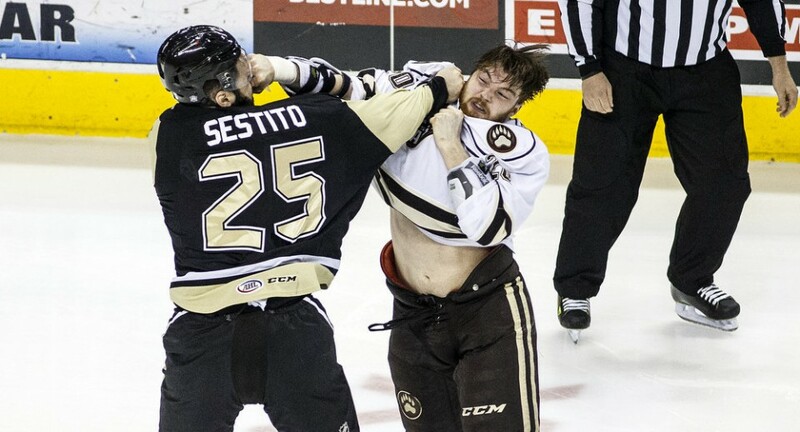 Sestito & O'Brien fight off of the opening draw. 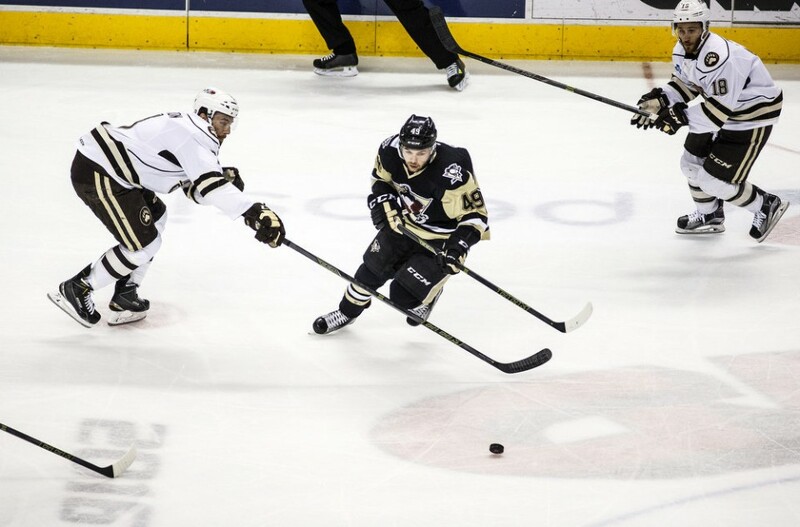 Wilkes-Barre - Dominik Simon was in on the 3rd line for Gill. He had not played since suffering an upper-body injury late in Game 1 on the Liam O'Brien hit which earned him a one game suspension. Harrison Ruopp played for the injured Niclas Andersen (day-to-day, lower body). Hershey - The Bears used the same exact lineup as they did in Monday NIght's Game 4 OT Loss. Tom Sestito and Liam O'Brien both started and were lined up next to each other, and the entire Giant Center knew what was coming next. The two had been exchanging some not so nice words on twitter since Monday Night, and they settled it right off of the opening faceoff. A vicious fight that saw both big men take hard shots to the face and head. 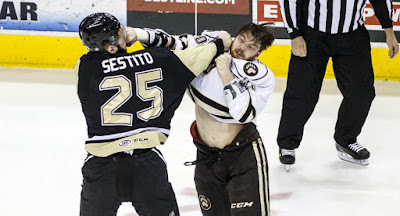 Sestito would earn the decision victory, but would hammer O'Brien while he laid on his back and "Tito" earned a 10 Minute Misconduct for Unsportsmanlike Conduct. WBS would control the majority of the play in the period but couldn't capitalize. The Bears however, created several quality scoring chances and took advantage. First, Carter Camper stole a puck from Ruopp behind Jarry's net and Camper caught the young netminder sleeping and slid it between the pads to give the Bears a 1-0 lead. 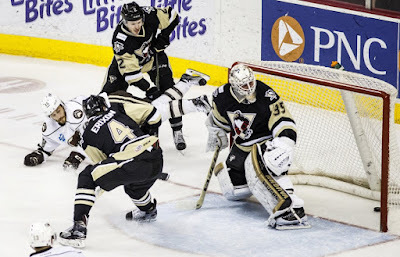 Late in the stanza, Hershey was on a 5x3 PP, and former Penguin Zach Sill made a beautiful backhand pass to Jakub Vrana in front of the net who beat Jarry five-hole. Carter Camper celebrates his 1st Pd Tally. Again the Penguins would come out and get some quality zone time but were unable to solve Peters just yet. The teams would trade failed PP's and the physicality was really picking up. A number of big hits from both teams really had The Giant Center crowd into it. At the 9:05 mark of the 2nd Aaron Ness threw a bad angle shot towards Jarry's net, and after bouncing off of Bears forward Sean Collins, the puck trickled by the Penguins goaltender. Jarry watches helplessly as the puck trickles in to make it 3-0 Bears. At this point Casey DeSmith was putting on his gear getting ready to enter, but he wasn't ready quite yet so the refs dropped the puck. 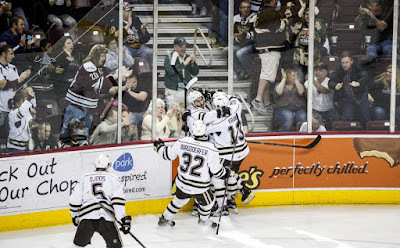 The Pens would get on the board just :39 seconds after the 3rd Hershey goal, when TK banged home the rebound of a Jake Guentzel shot in tight. The Captain's goal rallied the Pens and they would make a big push. Casey DeSmith entered the game immediately following TK's goal. Josh Archibald would score in the latter minutes of the Period, to cut the Bear lead to one, and more importantly the bottom 6 forwards were starting to chip in. The Penguins would officially stun the Giant Center crowd when early in the period Josh Archibald made a pretty chip pass to Blueger. Teddy would take off and start a 2-on-1 with big Tom Sestito. He then made a perfect pass to the tape of Sestito, who left no doubt with a gorgeous wrister to the top shelf. The Big Fella celebrated a bit excessively by shushing the crowd (which had booed him all night long) and using the forbidden "throat slash." He would receive his second misconduct which meant his night was over, which was bad news for WBS as he has been so effective all postseason. Sestito skated off the ice while firing up his teammates and urging them to finish what they had started. A minute later with the Pens pressuring to take the lead, they would draw a penalty. The PP would have their chance to give them a lead, which seemed unthinkable early in the second period. Late in the PP, Zach Sill picked off a pass and went in alone on DeSmith and beat him 5-hole despite the best efforts of a hustling Dominik Simon. The former Penguin had delivered the killer blow to his former team in Game 5. The Pens would generate a few good chances, specifically a Dustin Jeffrey 2-on-1 snap shot which Peters snatched out of the air with his glove. Ryan Bourque would calmly bury an empty netter from center ice for his first of the playoffs, it was assisted by who else, Zach Sill. 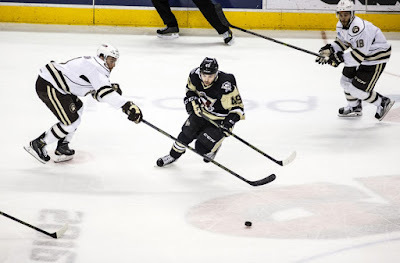 "Siller" as he was called in Wilkes-Barre would finish with a 3 point night. The return of Simon wasn't enough for the Penguins tonight. - The Penguins have now given up 4 SH goals in 8 playoff games. That includes a pair of SH GWG's for the Bears in this series. WBS needs to make an adjustment here or are risking losing a series while having the man-advantage. - Daniel Sprong saw very little 5-on-5 ice time last night, although he did play on the 2nd PP unit. This team lacks finishers, I think Donatelli needs to put this kid out there and hope for the best. - Dominik Simon looked really sharp in his first game back. He does so many little things to create scoring chances for his team. I'm expecting at least a Goal from him Friday Night. - Tristan Jarry faltered in his first road playoff game, and it is indeed a hostile environment. I would expect to see Casey DeSmith play in Game 6. The Bears have had a big edge in Goaltending consistency. Peters has made WBS earn every single goal. - Sestito received an abuse of officials penalty in the locker room area after the game and there is speculation that he may be suspended. If that is the case, the Penguins will have a hard time replacing the big guy. He now has a goal and 3 assists in 5 playoff games. His presence on the forecheck is where he will be missed the most. - Former Penguin Sill has been the best player in the entire series in my opinion. He has done it all, literally. - The Penguins will need a quick start in Game 6, if the Bears score early and smell blood, it may be over on Friday Night. Thanks so much for reading! I always appreciate it, and you can always find me on twitter @jfoo1654.